The story is about Alice Queensmeadow who was able to save her father by helping Oliver Newbanks task. Alice is a girl who was born without “colour”. She is described as a very pale girl. This was the reason why she was so unique that people thought she was not special. It was because people who were more colourful had more magic in them. Alice knew she was different and her real powers also added to her frustration. Her special talent should help her with this predicament but it did not. Oliver bullied Alice when they were younger which made her hesitate to help him with his task. Since his task was to find her father, it became apparent to Alive that she should help Oliver. Just like in the story, Alice in wonderland, Alice went down the rabbit hole with Oliver to a very different place from Furthermore. It was the very adventure Alice Queensmeadow needed to appreciate herself more and to make a real friend too. The story was so whimsical that every colour had a characteristic which could be felt by the reader. Tahereh Mafi has a way with words which just makes you want to just read the book in one sitting. At first, I had reservations in reading this book because it was middle grade. However, after being twenty pages in, I really was enjoying the very colourful story. Also, Alice could relate to anyone. This is because nobody is judging you as harshly as you judge yourself. I felt that the ending of the story was rushed. It just felt that the story could have five more chapters and the ending would always be the same. I liked the idea of the different places in Furthermore. However, the people were really cunning and sly that if Alice and Oliver would be captured they would be eaten because of their magic. 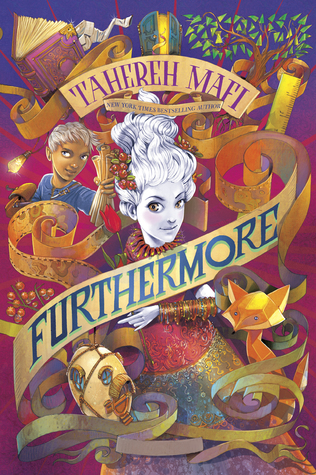 Furthermore is a good story for both adults and children. It stimulates the brain to imagine a different world from ours. Also, it reminds us the value of self worth which would only be enough when you love yourself. Somehow, trials would make you realise that nothing could be done alone. A friend is also important because family might not be able to be with you always. This book made me realise that love is a form of magic that makes us change for the better. My reading experience with this story was fun, exciting and insightful. It was so magical and whimsical that I can’t help but visualise Ferenwood and Furthermore. I honestly haven’t read something as colourful as this book. I am looking forward to read the second book which is Whichwood. I gave this book a 4 hearts rating because it was a very wonderful book to read and it really has a lot of potential in terms of world building. The writing style was superb too. However, I had a problem with the ending. It was too rushed for me that it fell short, but it was a happy ending which satisfied me.